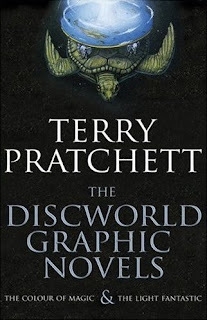 THE DISCWORLD collection – which combines in graphic novel form two previous stories by novelist Terry Pratchett – is an odd book with an even odder tale and yet, Pratchett and the writers who have adapted his stories mostly pull it off. The hardcover collected edition of two stories – THE COLOUR OF MAGIC and THE LIGHT FANTASTIC – is set on world traveling through time and space that is balanced atop four elephants, who themselves are standing on a massive turtle pushing its way through the universe. Pause your thought there for a moment. A world moving through space atop elephants and a turtle. Well, after a few pages of DISCWORLD, the reader who comes to accept this oddity as a truth is fully immersed in a place where a mysterious traveler from another place, accompanied by a magical luggage trunk that will follow its owner anywhere, (and I mean anywhere) is met by a failed wizard who has one of DISCWORLD's eight most powerful magical spells lodged somewhere in the deep recesses of his brain. These two miscreants meet any number of strange characters on their travels – a legendary hero who is now pushing 90 years old, trolls who are the size of mountains, trees that can talk, dragons that are created from one's imagination – as they push into the boundaries of Discworld in hopes of saving the place from impending disaster. The plot arcs across both of these stories (which were first published in the 1980s and republished this year in this beautifully bound edition) and just when all seems lost to the inhabitants of Discworld, Rincewind the failed wizard finds the source of magic inside himself for the very first time and unknowingly puts the world back on the right track. Even the great turtle, A'Tuin, finds solace at the end of the book, as what seemed like signs of a certain disaster were really signs of a magical rebirth. The DISCWORLD stories have their strong points, although there are times when the plot meanders off in unexpected directions (Rincewind, for example, has a habit of suddenly moving into different worlds with scant notice to the reader. One frame you are here, the next frame, you're not). While graphic novels and comics often use the space between frames for inferential reading, Scott Rockwell, the adaptor of Pratchett's books for this series, could have used more focus at times to keep the reader on track with what is going on in the story. That said, Pratchett's visionary world is a fully informed one, with just enough similarities to our own to make it feel as if it were taking place in some dark, backroom alley in a rundown city somewhere, with just a whiff of magical surprise in the air to make you expect the unexpected. For the most part, the artwork is rich and luminous, but as with the writing, it can also be inconsistent in tone, depth and quality. Perhaps, if a reader were to view the story segments separately, over time, as in a monthly comic book, the disparity would not be so obvious. But in a collection of this size, with one story chapter moving right into the next, the shift in illustrations is very obvious, particularly in THE LIGHT FANTASTIC. It can take time to adjust to the different styles that veer from the serious and detailed to a more traditional comic book style of murky expressions on faces. Even so, the visual rendering of DISCWORLD, and the giant turtle hurtling through space, is quite a sight. In one particular scene, where the characters stand literally on the edge of the world, the artist has done a fantastic job of forcing the reader to hold their breath as we peer down into the abyss below. This book collection is clearly aimed at young adults, with big themes on the meaning of life, good and evil and other mature material. There are flashes of violence, with some blood as a result of fights, and the female characters are (stereotypically) dressed in almost nothing. There is no overt profanity or inappropriate language. DISCWORLD offers some possibilities for philosophical discussions among high school students regarding the nature of our perception of existence (how do we know our world is not balanced on the back of a giant turtle?). The books also twist the concept of a traditional hero. For example, the most esteemed hero in DISCWORLD itself is not some young strapping man with huge muscles, but a withered 90-year-old named Cohen the Barbarian who is missing his teeth and speaks with a lisp. Another main character, Ringwind, is a wizard who has no magical abilities and is considered a failure by all who know him. These characters provide ample opportunity for teachers and students to discuss the virtue of creating a character outside of normal expectations with plenty of flaws on which to build a plot. Recommended, with some reservations, for high school students. Browse inside the book. Find out more at Wikipedia.